Forgetting the Future is the sixth studio album from Melbourne rock royalty British India. Featuring current single Precious, it’s set for release on Friday 22nd September. Today the band are excited to reveal the visually arresting video for Precious, as well as announce a massive 32-date national tour in support of their forthcoming LP. Lead single Precious is currently spinning on rotation at triple j. Its stylistic new video comes courtesy of the talented team at Oh Yeah Wow. Smoke, colour and flames surround the band, as visuals vividly portray the tragic beauty of momentary bliss. It’s incredibly executed and out now for your viewing pleasure. 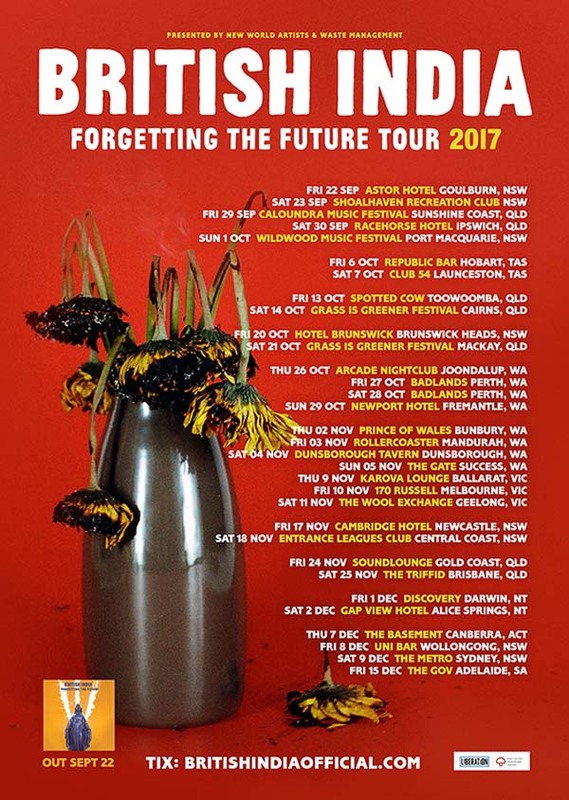 British India have earned themselves an honest reputation as one of the country’s hardest working bands, and their upcoming national tour reaffirms this. With ten expansive new tracks added to their repertoire, the band will be hitting up cities all over the country for three months, kicking things off this September. In celebration of the album’s announce, British India have also locked in a special one-off show at Melbourne’s Howler, on Wed 16rh August. The exclusive album preview show is available only to fans who pre-order the album from their webstore. Throughout a remarkable ten-year career, British India have attained four Top 10 ARIA albums, seven entries into the Hottest 100 and their single I Can Make You Love Me is also accredited Gold in Australia. The band’s previous LP, Nothing Touches Me featured popular singles, Suddenly and Wrong Direction which have collectively accumulated over three million Spotify streams.